In Java, one-to-one relationship (normally called association) is where an object has a reference (instance variable) of the other object. In JPA world, these objects are nothing but user defined entities. The object which has the reference is known as source object (owner of the relationship) , whereas, the object which is being referenced is known as target object. In this relationship, same target object instance is not shared (repeated) with different instances of the source object, otherwise it will become many-to-one relationship. 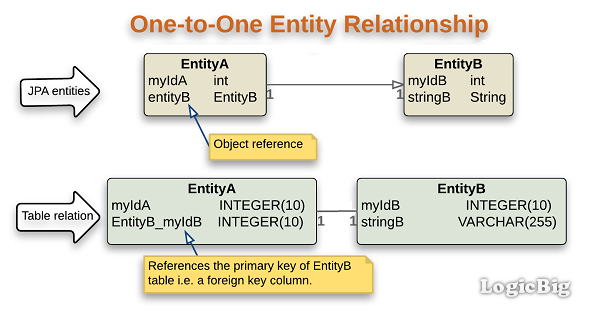 In database world, one-to-one relationship is where a table A has a special column, known as foreign-key column, referencing to the primary key column of another table B. Table A is known as child-table, whereas, the table B is known as parent-table. In JPA, we map one-to-one association of objects to parent-child tables by using @OneToOne. This annotation is used in the source class and placed on the field/property of the target reference. The source Java entity corresponds to the child table (the one which has the foreign key column) and the target entity corresponds to the parent table. Following example demonstrates how a one-to-one Java object association is mapped to database one-to-one entity relationship. Here's a quick review of above example. - then the name of the primary key column in table EntityB. In above example, we focused on Java object to database table mapping. In this example we are going to populate and persist our entity objects. Nothing persisted in EntityB table. @OneToOne has an element; 'optional'. By default it's value is true. If we set it to false then a non-null relationship must always exist. Following example demonstrates that setting 'optional=false' and persisting EntityA with null reference of EntityB, will throw an exception. If we want to propagate operations performed by EntityManger from the entity having @OneToOne to the associated entity, then we can specify a suitable value for cascade of @OneToOne. By default no operations are cascaded, that's why we had above exception. In following code, we have to persist EntityC only, that will persist EntityD as well. We will be discussing other elements of @OneToOne annotation in upcoming tutorials.